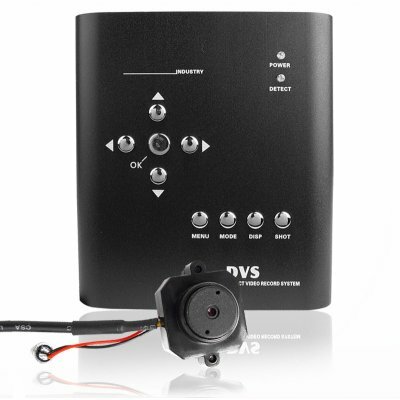 Successfully Added Digital Motion Detector DVR + Button Camera Combo (USA) to your Shopping Cart. The Digital Motion DVR system operates as a powerful camera that detects motion and records automatically. This practical system can also be set to manually record to provide maximum flexibility. Pictures are conveniently stored in the internal memory or SD card for later retrieval and inspection, on either TV (monitor) or computer (requires simple installation of a reader). Video is shot in a 20 second clip in order to maximize storage efficiency. A one button CMOS camera to take covert videos. This item is straightforward to use and set. It would be perfect for those who want to maintain maximum security over a fixed area or field of vision, e.g. store front at night, for a specific period of time. In particular, it would be a great asset in protecting valuables or a vulnerable physical space from intrusion. This model is the NTSC color version, for use in the US, Canada, Mexico and other regions that use NTSC.